Use the Enterprise Decision Management transformation to generate Enterprise Decision Management output in the context of a SAS Data Integration Studio job. The transformation uses an Enterprise Decision Management flow package that is created in SAS Decision Manager. The package is used to structure the data in an input table and generate columns in the output tables. The Enterprise Decision Management transformation maps physical data to decision flows. The output tables attached to the transformation produce decision-making results from the mapped input data. SAS Decision Manager supports collaborative maintenance, governance, and continuous enhancement of analytical models for operational decision making. The required inputs, or columns, for an Enterprise Decision Management flow job are defined by Enterprise Decision Manager. Each Enterprise Decision Management flow job that you run in SAS Data Integration Studio requires a source table that contains the required inputs defined by the Smart Object. However, when the source table columns are not equivalent to the required input columns, a view is generated as input to the job. Therefore, you should try to use a source table with column names that are identical to the defined required inputs to enhance performance. ERROR: Duplicate declaration for correlation_id with incompatible types. Mixed-case reply variables contained in Enterprise Decision Management flow packages can cause Enterprise Decision Management flow jobs to fail when you run them in SAS Data Integration Studio. To avoid this problem, select the Enable case-sensitive DBMS object names check box on the Physical Storage tab in the properties window for the EDM Results tab. You want to generate Enterprise Decision Management output from a source table in a SAS Data Integration Studio job. 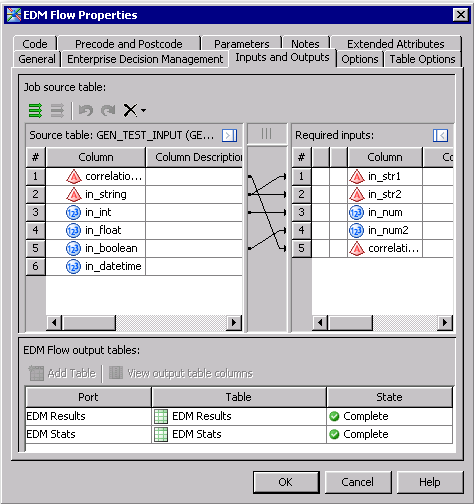 Create an empty SAS Data Integration Studio job with an appropriate name, such as EDM Output Job. Select and drag an Enterprise Decision Management transformation from the Transformations tree. Then, drop it in the empty job on the Diagram tab in the Job Editor window. Select and drag the source table from the Inventory tree. Then, drop it before the Enterprise Decision Management transformation on the Diagram tab. The source table for the sample job is named GEN_TEST_INPUT. Drag the cursor from the source table to the input port of the Enterprise Decision Management transformation. This action connects the sources to the transformation. 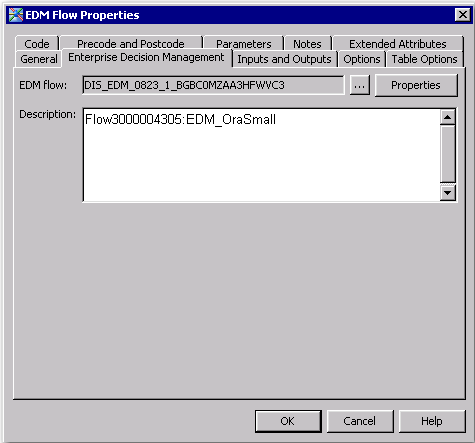 Note that the Enterprise Decision Management transformation is named EDM Flow in the context of a SAS Data Integration job flow. To configure the Enterprise Decision Management transformation, select an Enterprise Decision Management flow in the Enterprise Decision Management tab. Then, map all required inputs with source table columns in the Inputs and Outputs tab. When you select an Enterprise Decision Management flow, the output tables associated with the Enterprise Decision Management flow are added to the job flow. Note that you can select one of the output tables listed in the table and click View output table columns to review its columns. Right-click on an empty area of the job, and click Run in the pop-up menu. SAS Data Integration Studio generates code for the job and submits it to the SAS Application Server for execution. If the job completes successfully, you can right-click an output table and click Open to review its output table. The following display shows a view of the EDM Results output table. The temporary work tables for the Enterprise Decision Management transformation should be left in SAS data set format. Otherwise, the transformation might fail. Transformations in a job typically create temporary work tables as they execute. 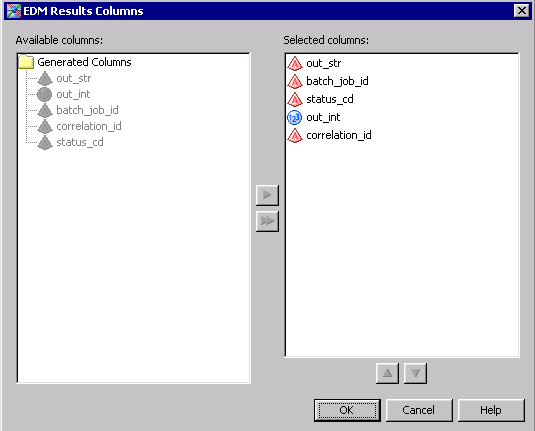 The default work tables are SAS data sets in the SAS WORK library. You can redirect these temporary tables to an alternative format and location, as described in Redirecting Temporary Output Tables. However, the temporary work tables for the Enterprise Decision Management transformation should be left in SAS data set format. The Enterprise Decision Management transformation requires an Enterprise Decision Management flow. SAS Decision Manager 2.1 can produce this flow. SAS Decision Manager 2.2 cannot produce this flow. In order to use the Enterprise Decision Management transformation, you can use SAS Decision Manager 2.1 to export the flow to a location where the Enterprise Decision Management transformation can access it. You can also use a version of SAS decision management software later than SAS Decision Manager 2.2 to produce this flow. The global option "Use run time lookup for credentials for statements requiring credentials" should not be enabled when you run a job with an Enterprise Decision Management transformation, and the input to that transformation is an Oracle table. If you disable this option, any SAS Data Integration Studio job with SAS Connect sign-on statements will include user names and passwords in the generated code.